Selecting an RF Shielded Test enclosure involves the selection of an enclosure that will easily contain the device(s) you wish to test, as well as the proper interface connections to allow you to measure the parameters of the device you wish to test. Obviously, the internal dimensions of the enclosure must be large enough to contain the device as well as any associated cables or connections to it. Be sure to consider the 'bend radius' of the cables as well as the actual connectors. Many devices require an RF adapter from the device to a common coaxial cable and sometimes the adapter may be more bulky that the actual device. It may be helpful to gather these components, connect them all on the bench and then measure the actual outline area of the setup. In some cases the device must be powered and requires the use of an external battery pack or AC adapter unit. This is mentioned for both the size perspective as well as the powering requirements which will need to be addressed as another I/O consideration. When you are comfortable with the general size required, consider whether you will envision using the enclosure for future product development 'creep' which is common in new designs. 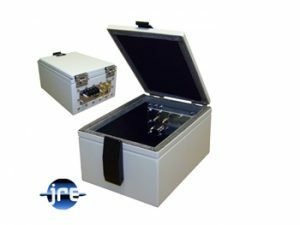 The wide variety of JRE Test enclosure sizes will most likely come very close to a suitably sized unit for your tests, if not, we can modify an existing enclosure for your needs or even design a custom sized enclosure. Bear in mind that modifications or new designs will lengthen the lead time as well as entail engineering charges depending upon the complexity and time involved. Across our wide variety of enclosures, there are just four I/O plate sizes, and these plates are easily changed in the field, one enclosure with multiple I/O plates and connector configurations offers a world of possibilities! Now that we have a handle on what mechanical size of enclosure will be suitable, let's consider the I/O requirements. Does your device require power? What is the power requirement, AC, DC, Battery? What sort of test stimulus will you need to present to your device? What frequency limits do you wish to address? Will there be signals radiated inside the enclosure which require an antenna? Is there high power RF being radiated, frequency? Will there be data signals that need to be connected to your device? Are there data signals that you wish to receive from the device? Will there be appreciable heat developed from the device, does it need to be cooled? These are but a few of the measuring variables that will need to be considered. Let's discuss them in a bit more detail. When the shielding barrier of the test enclosure is crossed, the potential to degrade the shielding isolation becomes a consideration. Any conducted RF signals on the power cable need to be filtered as they cross the enclosure wall. In most cases we use a feedthru capacitor style filter to appropriately filter the conductor. This feedthru filter is mechanically configured as a convenient barrier style terminal strip and is comprised as a 'Pi' style filter with two capacitors with a series inductor. This configuration provides 75 dB of filtering action at VHF and above frequencies, and is rated at 250 VAC/100VDC at 10 amps max. This feedthru provides excellent attenuation over a wide frequency range and is both rugged and easy to connect. If AC power is required inside, an internal AC 'power strip' is installed and wired through one of these feedthrus to the outside where a suitable AC line cord is attached. If the device runs on DC power, the feedthru inside the enclosure has quick connect terminals while the barrier terminal strip is available outside the enclosure for suitable power connection. Of course, if you have different or non-standard powering requirements we can assist in designing the proper interface, as an example, we have had 100 Amp DC as well as 2,500 Volt feedthrus! This is the area where you present your device with a stimulus RF signal or observe an RF signal from your device. There is no RF filtering on the coaxial cable passing across the shielding barrier as we do not want to impede the signal in any way. A normal 'Bulkhead' style RF connector is used to pass the enclosure wall and connect to the device inside and to the test system on the outside. From the system on the outside (whether it be an RF signal generator, spectrum analyzer or other such RF device) the shielding of the coaxial cable remains conductive all the way from the system, thru the enclosure wall and into the test enclosure, maintaining proper shielding from external signals. 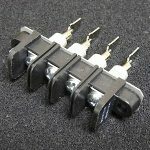 There are a wide variety of bulkhead connectors available with the SMA, BNC or N types most common. If you have a different or proprietary connector, a suitable adapter may be used. The inside of the test enclosure is by nature a closed area with little air flow for convection cooling. One must be cognizant of any possibility of heat buildup and how to remove this heat. In most cases this is not an issue as the act of opening and inserting the device to be tested will allow internal air temperature to equalize rapidly with that outside of the enclosure, however there are some cases where excess heat must be removed. Many JRE Test enclosures have vent options and even small fans to exchange internal air with the outside. High performance 'honeycomb' style vents are used to allow excellent shielding isolation while still passing air with little resistance. You will need to assess if your device requires such ventilation and select accordingly. What is the required area needed to contain the device under test? Take into account any associated connectors, cable bend radius, or mounting assembly to hold your device. What do you wish to measure? Decide what interface connections are needed to run your device as well as what connections are needed to implement your tests on the device. Select the interfaces required such as USB, LAN, serial data or other such signals. Understand there are simple feedthru capacitor style connectors as well as the high performance filtered interfaces such as the USB2-1 or LAN-1. There is no harm in adding extra interface connectors that you may potentially use later, unused connectors do not degrade the shielding isolation significantly. Will there be self powered devices inside the enclosure or will the device need to be powered, and if so, will that be AC or DC? An AC power outlet strip inside the enclosure does require a larger sized test enclosure. Will your device under test have heat issues that need to be addressed, this will dictate either vents or adding a fan to help circulation. Do you envision using the same test enclosure for many different products? It may be more economical to purchase a larger enclosure based upon the maximum size envisioned for your device. It is a simple matter to change out the I/O Interface plate with another one that is optimized for each device's test needs. 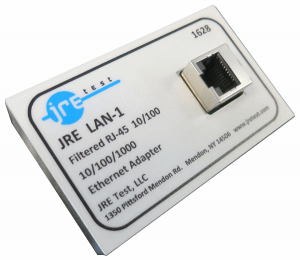 There are just a few common plates across the entire JRE Test enclosure line, so having a few extras allows great flexibility for most any test need. These plates are field replaceable and can be easily changed out using simple hand tools. Hopefully this short read will help you to zero in on selecting the proper enclosure for your test needs. 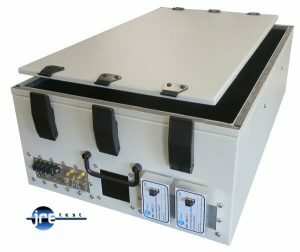 Of course, the entire JRE Test team is ready to help and answer any questions you may have, thousands of customers in over 30 countries depend upon JRE Test enclosures - after all, we invented the benchtop RF shielded test enclosure!